Dienes invented the PQAS ½ inch with adjustable depth Knife holders and continues to be a main stay to cut moderately hard materials. With one quick movement of the handle, an innovative integrated clamping mechanism securely and squarely locks the holder to the dovetail bar. 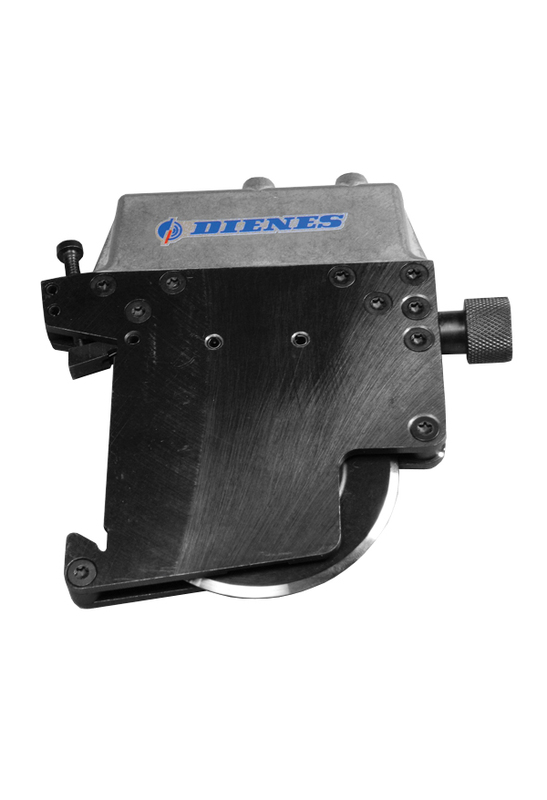 The Dienes PQAS knife holder delivers 75 pounds force at 90 PSI and is rated to operate at 950 feet per minute. All Dienes holders feature hardened side plates to increase holder life beyond anything else on the market. Dienes manufactures the holder to tight tolerances to minimize the wobble of the crush cut knife. The Dienes PQAS ½ inch holder is capable of slitting down to 12.7 mm (.5 inch) slit widths whether slitting paper, film, foils or tapes. This design employs an adjustable stop allowing the operator to restrict the stroke of the holder, scoring only the top layer of material without cutting through to the hardened anvil roll. When you are looking for slitting know how, and a high quality cut is required specify Dienes.